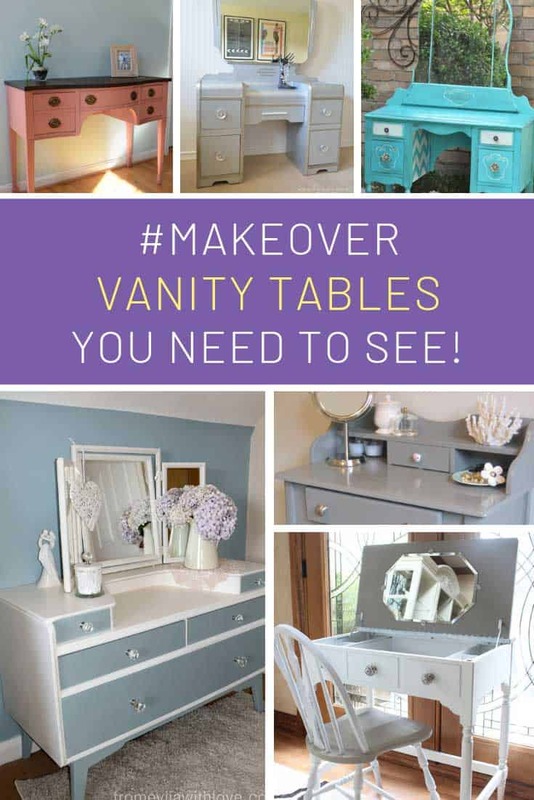 If you dream of having somewhere fabulous to sit and make yourself look beautiful you need to see these gorgeous dressing table makeovers. 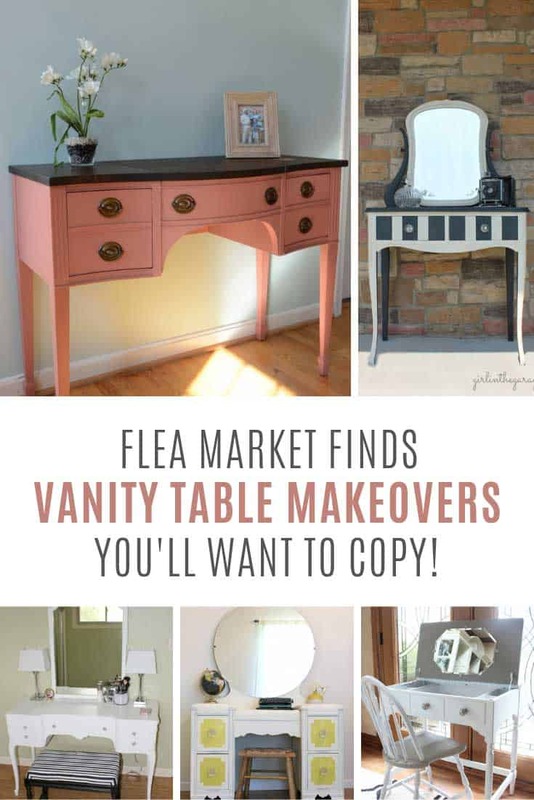 Most started out as vintage vanity tables that had seen better days, and with a bit of TLC have been turning into a stunning place where you can sit and apply your makeup! 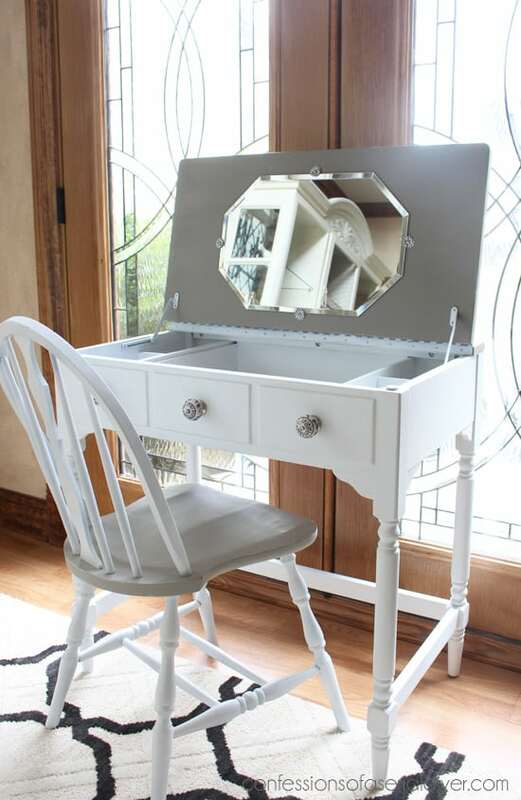 You don’t actually need to find a vintage vanity table, because sewing tables can be repurposed and with a bit of TLC and a lick of paint can be transformed into something beautiful and the perfect place to store and apply your makeup. 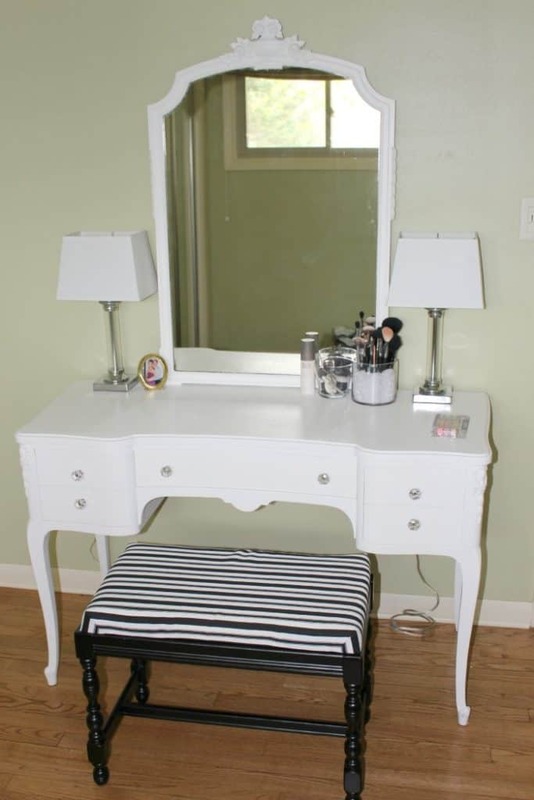 We really weren’t sure it would work out but boy does this striped vanity table look amazing! 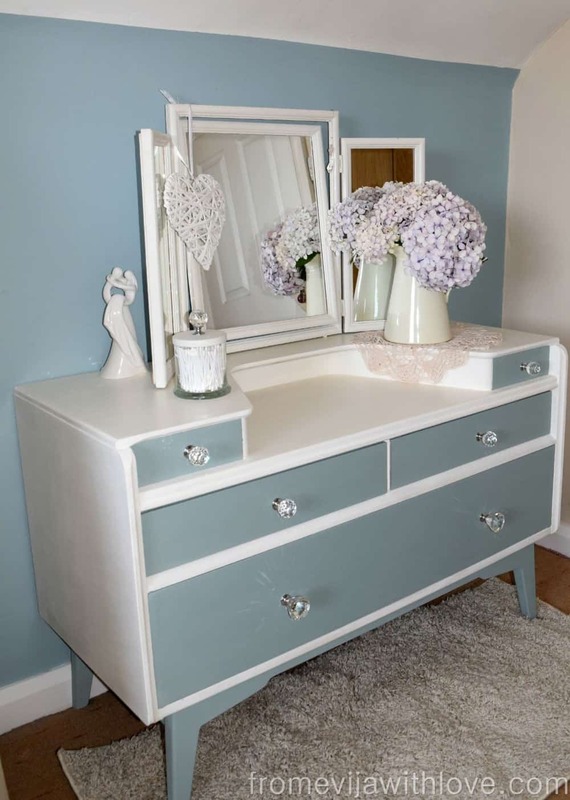 We love the colour of this vintage dressing table but using two different handles for the drawers really adds personality. 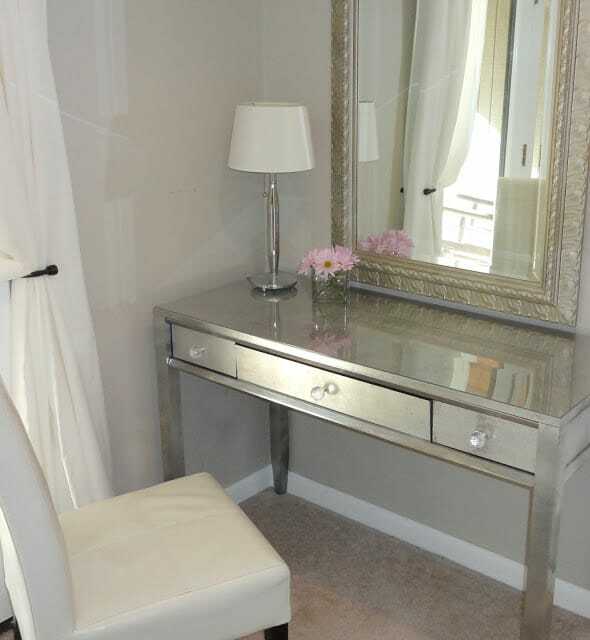 For a glamorous makeover to your vintage vanity tables silver spray paint to emulate the look of expensive silver leaf. The end result is stunning. 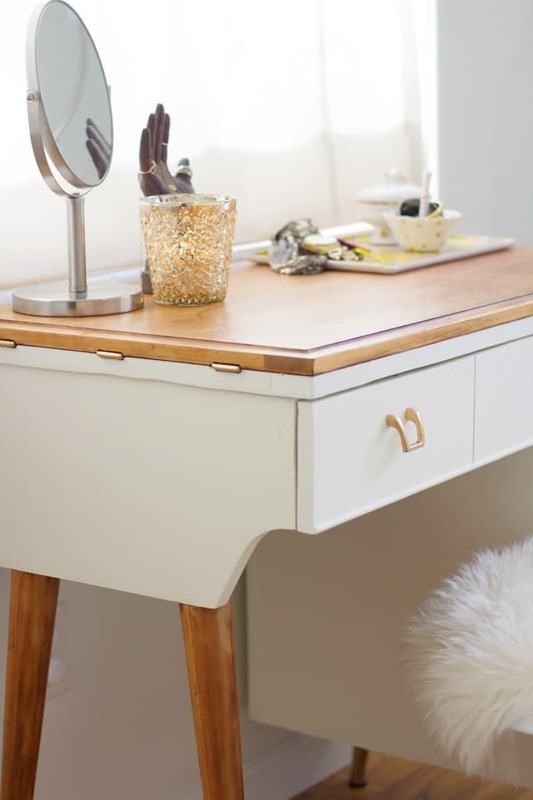 If you want to hide all your makeup and beauty accessories away from sight then try repurposing an old lid-top desk into a vanity table. 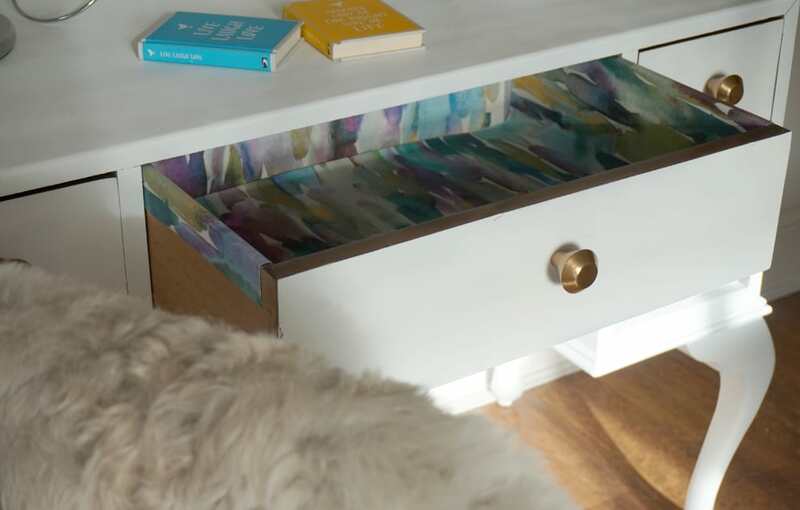 Adding a vintage mirror to the underside of the lid is the key to making this work. 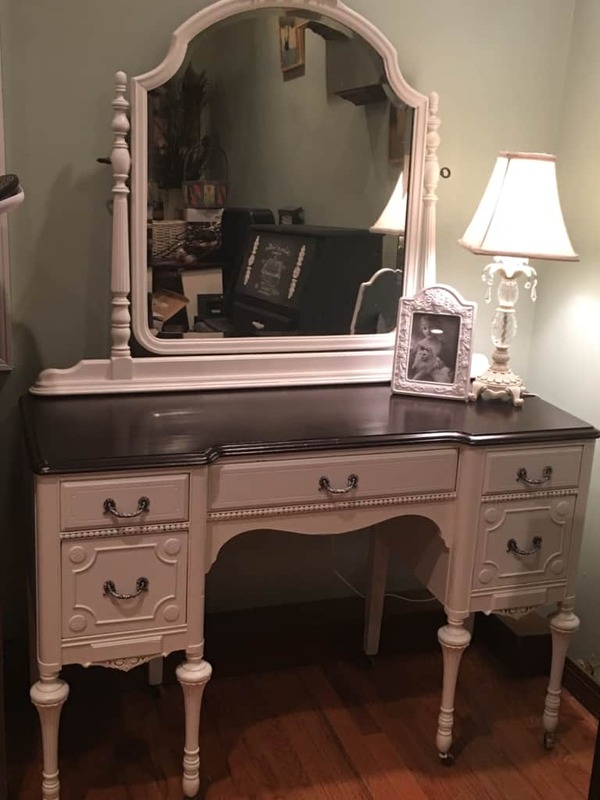 This 1940’s vintage dressing table had already had makeover when Karly picked it up on Craigslist, but it just doesn’t do it justice. 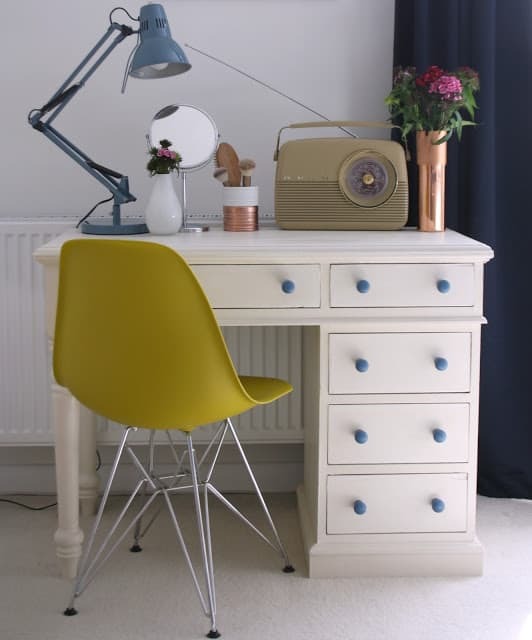 Don’t be afraid to take on someone else’s upcycyling mistakes and think about painting your table and stool in contrasting colours because it looks great. If you ever see a piece of furniture this beautiful snap it up quick, we’re still stunned that this vintage piece was picked up for just $15! 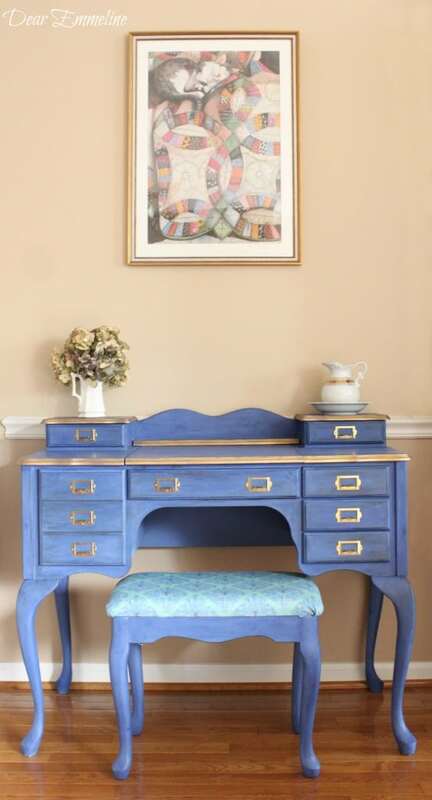 The blue is just beautiful and the brass handles really sets it off. 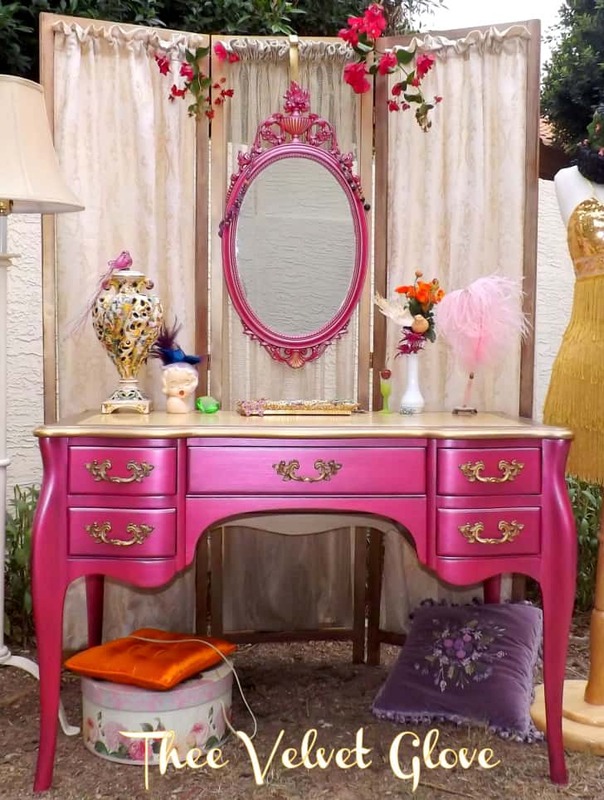 If hot pink is your colour of choice then you will love this makeover! 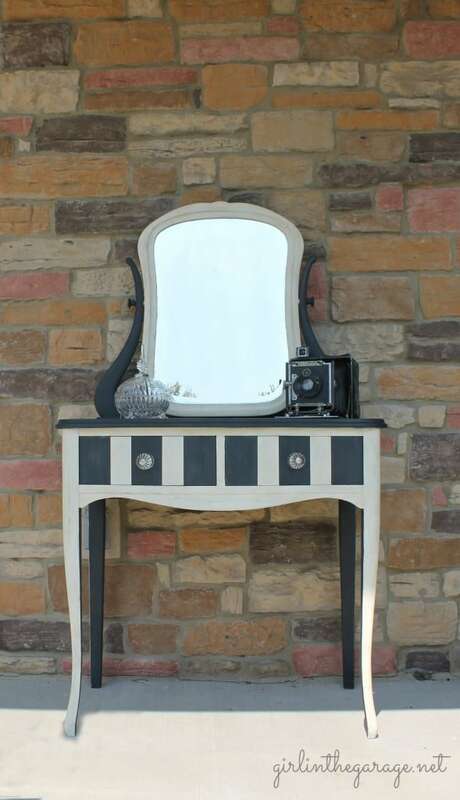 The stencilling on the top of this vintage vanity table just adds to the classic French feel. It really is stunning. 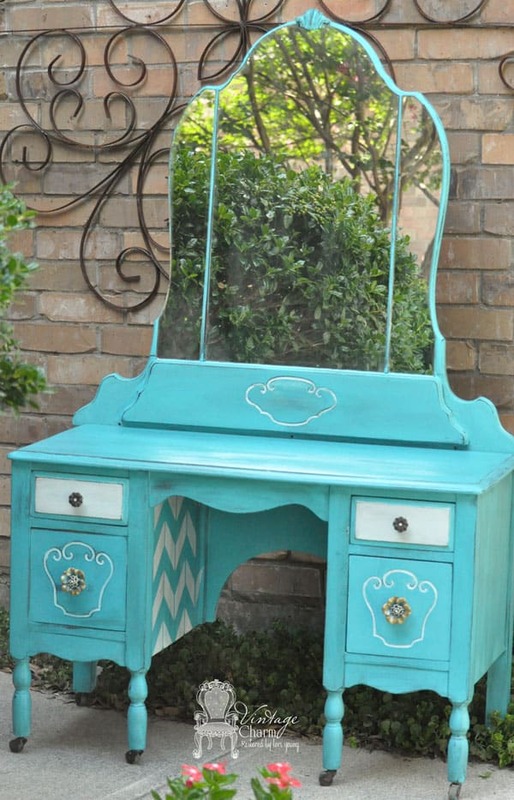 We love the colour combination on this dressing table makeover, and the chevrons added to the underside. 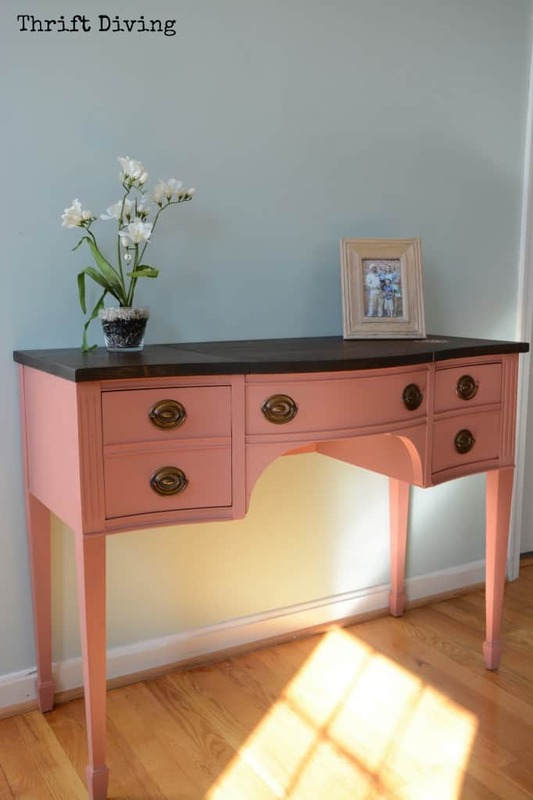 This Scandinavian pink chalk paint looks so great on this vintage vanity it looks like it was always that colour. 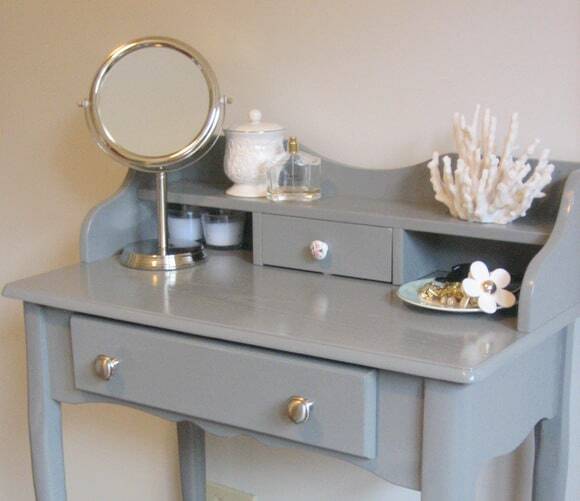 You don’t have to paint a vintage dressing table to breathe new life into it, sometimes all it needs is a bit of TLC and a coat of varnish to create something stunning in your bedroom. 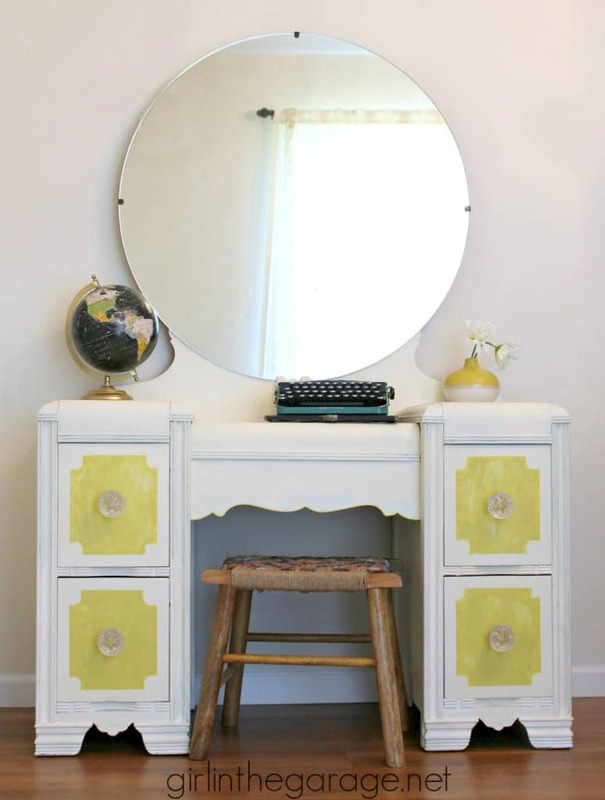 This gorgeous vintage waterfall vanity looks really good with the splash of yellow on the drawers to lift the white. 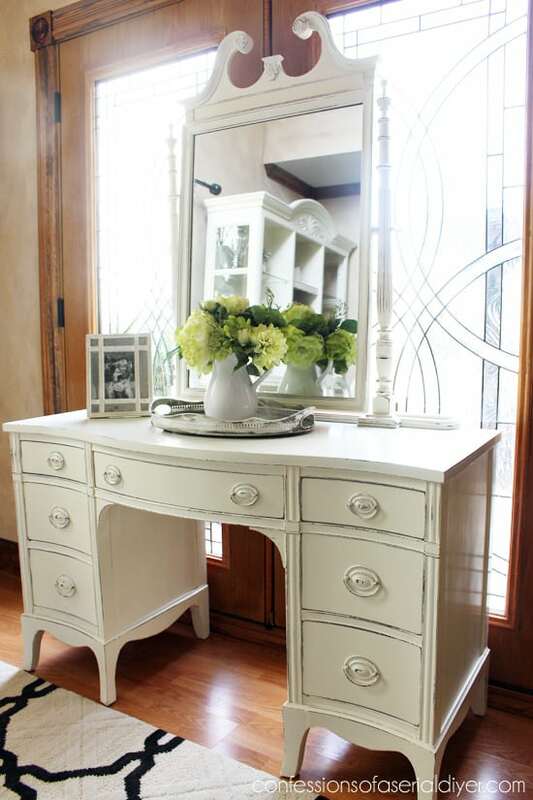 Try keeping the wooden dresser top but painting the drawers and mirror for a fabulous two tone effect. 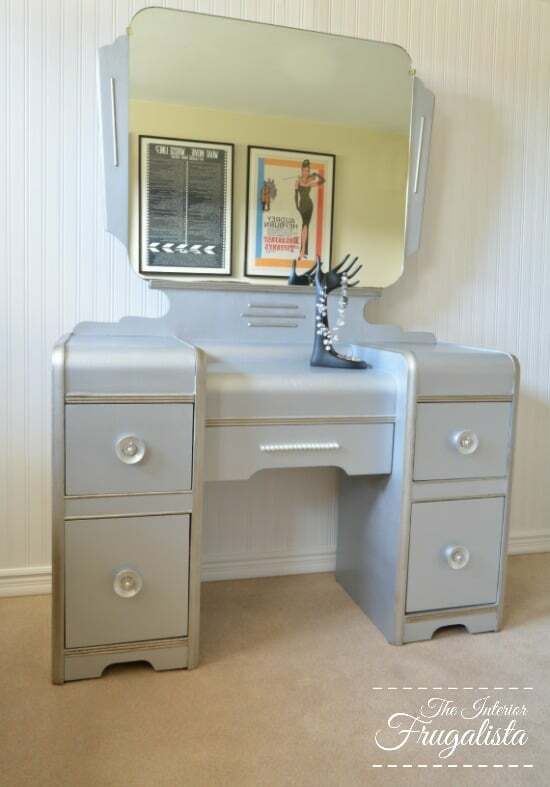 This art deco vanity table looks absolutely fabulous with a sparkling silver makeover, and we love the pearl beaded drawer handle! 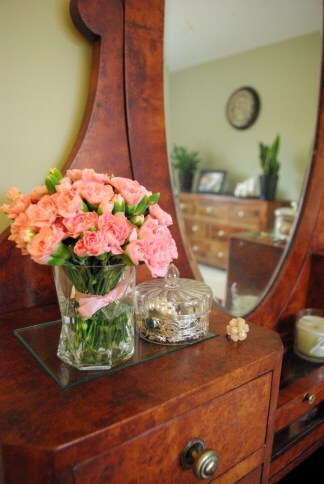 Don’t forget about inside the drawers while you’re making over your dressing table. Use a scented patterned lining paper to brighten them up and make your things smell lovely. Every after a gorgeous paint job the vanity table can still look a little dated, so think about adding some lovely glass knobs like these. 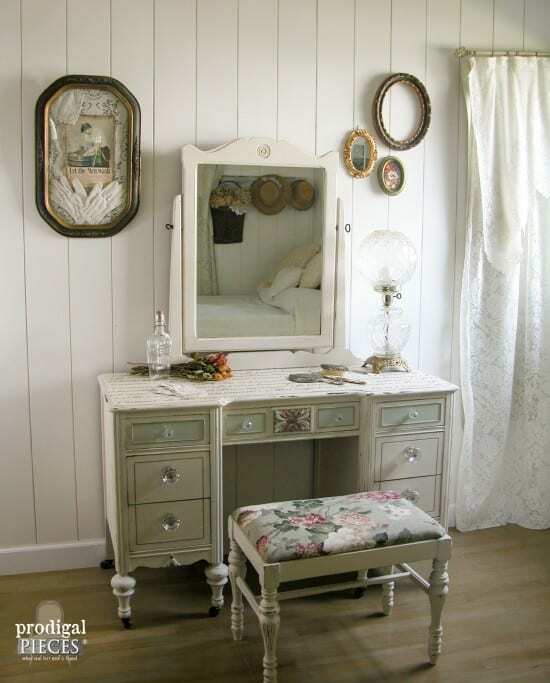 Most vintage dressing tables are dark wood but that doesn’t mean they need to stay that way. Just be sure to use a couple of coats of shellac before painting because it stops the colour from bleeding through. You can easily get spray shellac here.